Switzerland is one of those places you read lots of magical stories about and see beautiful photographs of. It wasn’t however somewhere I ever imagined that I would be able to visit (at least not anytime soon). Being one of the most expensive countries in Europe, it was a distant dream. That was until my partner and I decided to embark on a van life adventure last September. Suddenly, visiting Switzerland was within our reach. We swapped expensive hotels for van accommodation and parked our camper alongside lakes, up the top of mountains and deep within the forests. The natural wonder of Switzerland was at our doorstep and having our trusty T4 with us meant that we could afford a 3 week-long road trip through the beautiful country. A little less than a week after leaving the UK we had rolled excitedly into Switzerland. We had lusted over photos of the alpine pastures and the snowy mountains and were beyond thrilled to be on Swiss soil ready to explore! The next few weeks would see us driving up mountain passes, running around cities, hiking in the hills, swimming in the lakes and relaxing under the stars. In Switzerland there are no wrong turns. Every road travelled is more scenic than the last. We had such a good time that I couldn't imagine going back without our van to lead the way. Below are just a few of our favourite spots to drive along in Switzerland. Lake Lucerne is absolutely the epitome of Switzerland. The beautiful turquoise lake is surrounded by snow covered mountains, rolling green hills, with cute little villages in between. It is therefore the perfect setting for slowly driving around in the sunshine in the summer. We found a lovely quiet spot on the edge of the lake next to a small marina to call home for a couple of days. We spent the warm evenings relaxing and cooking and the mornings swimming in the clear lake before the rest of the world had woken up. When driving on the Furka Pass it is easy to understand why it’s one of the most famous mountain passes in the world. Incredibly scenic and one of the highest roads in Switzerland, the drive is exhilarating and not to be missed if road tripping through the country. We also passed beautiful glaciers and drove by the famous abandoned Belvedere Hotel. Another amazing mountain pass, the Klausen Pass snakes through the centre of the alps, passing breath taking forest views and postcard perfect villages. We stopped at the summit to make a cuppa and enjoy the views. We also made sure to fill up on clean fresh water before rolling back down the mountain. Side note: we did not pay for water once in Switzerland. Every road we travelled had fresh mountain water! Driving through the Albula Pass was another magical moment in our van. We stopped to make lunch by a waterfall under the train bridge where the famous Glacier Express flies by. We chatted about how amazing the train ride must be in the winter when Switzerland is covered in snow. The roads are steep, narrow and bumpy, a challenge that our little van took in his stride most of the way up. The journey would have been boring without a little overheating hiccup right at the summit, right? The Bernese Oberland region is pretty unforgettable. Surrounded by scenic mountains and gorgeous blue lakes the area is perfect for road tripping. We loved driving along Lake Thun and Lake Brienz, stopping along the way for refreshing swims. 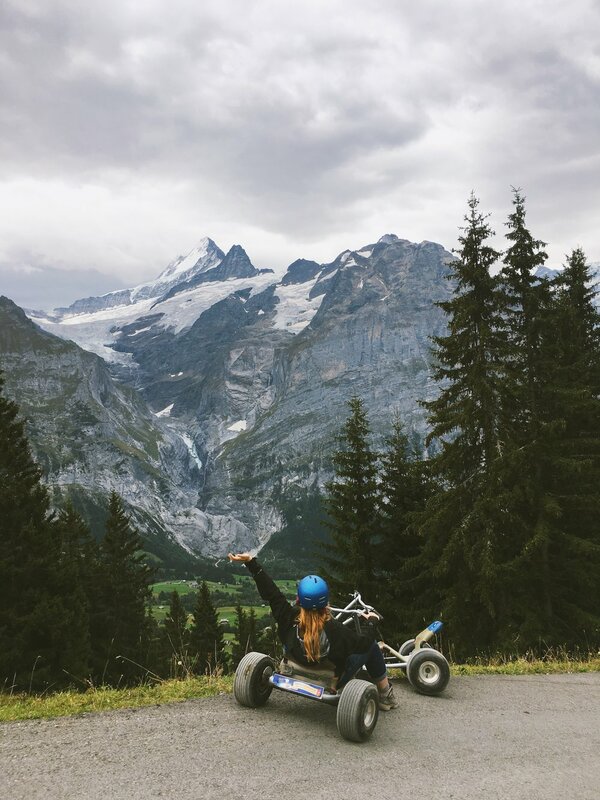 We adored wandering through Grindelwald for mountain hikes and mountain-carting. I tut to myself often as the photos I took here do not do the area justice at all. Bernese Oberland in the summer is essentially a massive nature playground and driving slowly around, stopping at charming little towns and climbing up the mountain passes is an unbeatable way to see the area. I have always loved a summer road trip. Sat in the passenger seat, music on, blue skies above, windows down and the wind in my face. Travelling through Switzerland, we stayed in our van the entire time. No hotel or hostel escapes. Just us, the van and the open road. Mountains and lakes ready to explore, memories to be made, views hidden around the corner waiting to knock our socks off. If you are dreaming of a grand summer road trip - do it!